Our Rental Packages include FREE DELIVERY to Albuquerque and within 50 miles of Los Lunas, NM 87031. If you live further than 50 miles of Los Lunas, NM 87031, you may incur a predetermined yearly transportation fee. For customers outside of our FREE DELIVERY area, please call us at 724-305-0782 for a delivery quote. 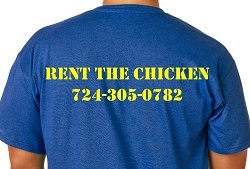 We will credit $50 off of your Rent The Chicken or adoption for every friend referred who Rents The Chicken. Refer six friends and your Standard Rental Package or Standard Adoption is free! (That is a $400 discount!) We only credit up to 6 referrals per year per customer. Credits can never be refunded as cash and can never be used for more than one Rental Season at a time.